Tough day at work so far? Your partner on your case about those groceries you forgot? 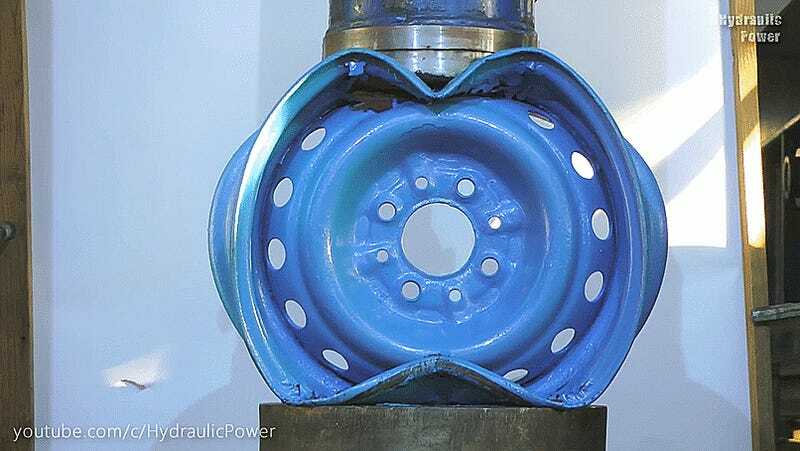 Get all your frustrations out watching this hydraulic press apply 500 tons of force to steel car wheel. Oh yeah. Crush, baby, crush! I’m sure there’s some Freudian explanation for my fasciation with slow-motion destruction. But I’m having too much fun watching metal things get mutilated under the unstoppable power of this crushing machine to worry about it. For those sorely disappointed when the wheel escapes about a minute in, don’t worry. It goes back in. If for some reason you find this entertaining too, there are several YouTube channels dedicated to the art and science of flattening things with a hydraulic press.